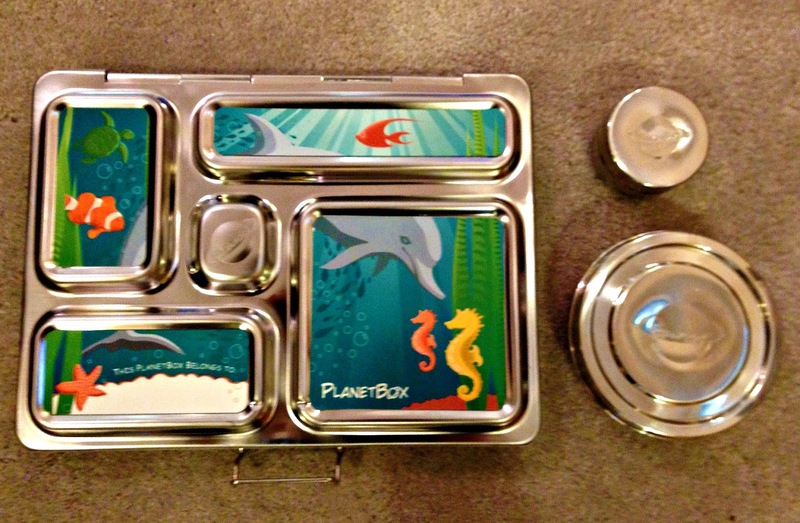 The creative parents behind PlanetBox wanted to design a lunch box that helped to promote healthy kids and a healthy planet. They desired to make it all-in-one, durable, with a simple to use latch, and easy to clean. The resulting lunch box accomplishes most of those goals. However, it isn’t perfect and there are some things to keep an eye on before you pack a lunch in it. 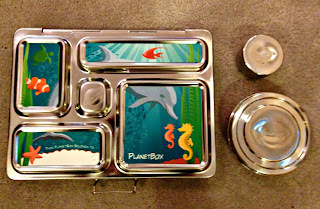 Click HERE to see the Finding Nemo Lunch I made in the PlanetBox Rover. 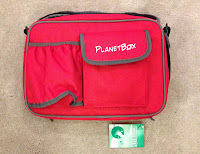 I reviewed the “PlanetBox Rover Complete” with CarryBag, magnets, and dipper set. This model retails for $59.99, however packages without the bag or dippers are available for less. There is also the larger “PlanetBoxLaunch” model. 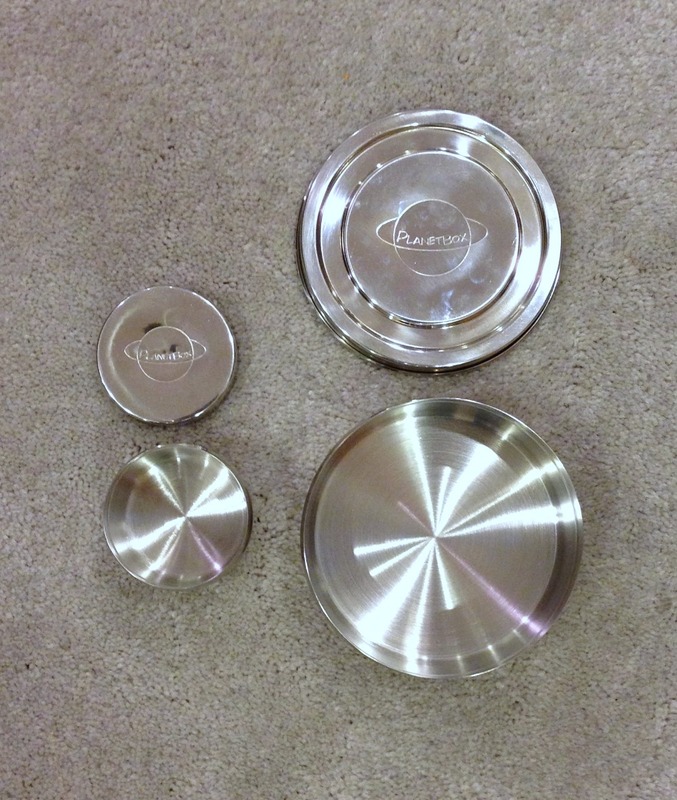 The lunch box itself is constructed out of stainless steel so it is non-toxic and very sturdy. 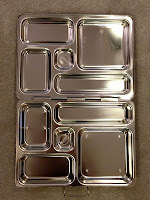 It is reminds me of a lunch tray with five compartments to hold food. The attached lid folds down and latches securely and easily. 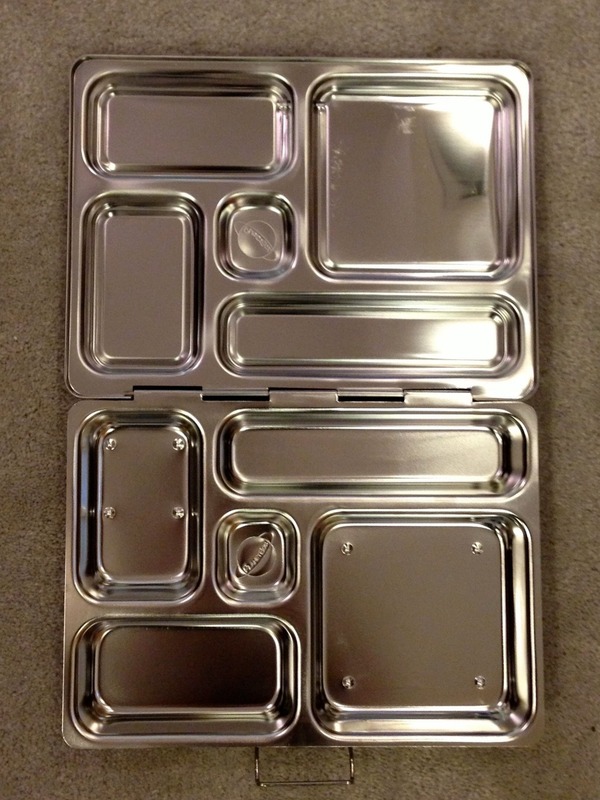 The Rover’s tray cleaned up nicely in the dishwasher. You can choose the style of magnets, which stick on the lid, to make fun designs. There are two drawbacks to this design. It is heavier than most lunch boxes and it doesn’t seal completely. You should not pack foods like yogurt or applesauce inside because they will leak out. To solve this problem you need a set of PlanetBox dippers. I found out the hard way that these are necessary when I packed Jello in the Rover tray. My daughter didn’t eat all of the Jello and it leaked everywhere. It was my own fault, however. The instructions clearly state that the Rover tray is not leak proof. 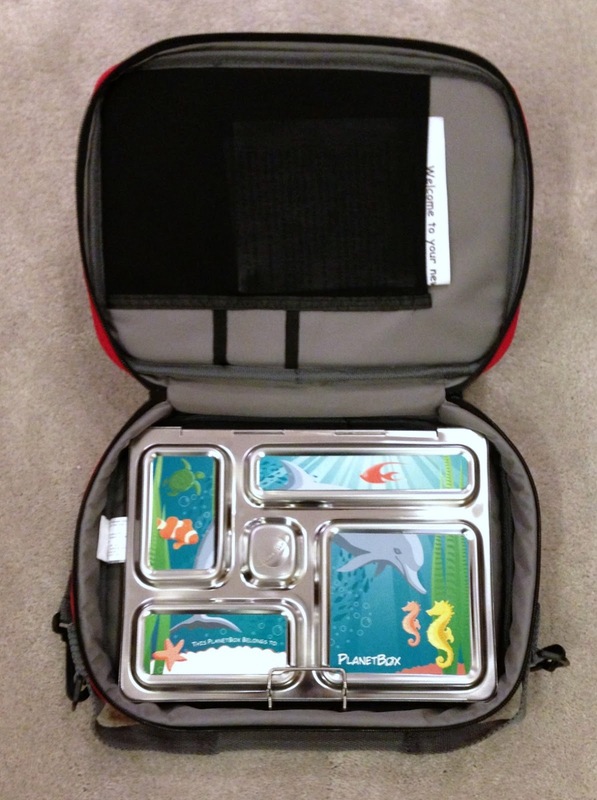 The dippers can fit inside the tray or in the pocket of the CarryBag. has one carry strap and one shoulder strap. One pocket on the outside can carry a bottle and the other can carry utensils or a dipper. There is also a pocket on the inside. The bag can be washed in soap and water. This is fortunate since it was very sticky after the Jello mishap. After a few uses the bag has a few small stains on it, but they don’t bother me much. The CarryBag is handy because it fits the Rover and accessories well. 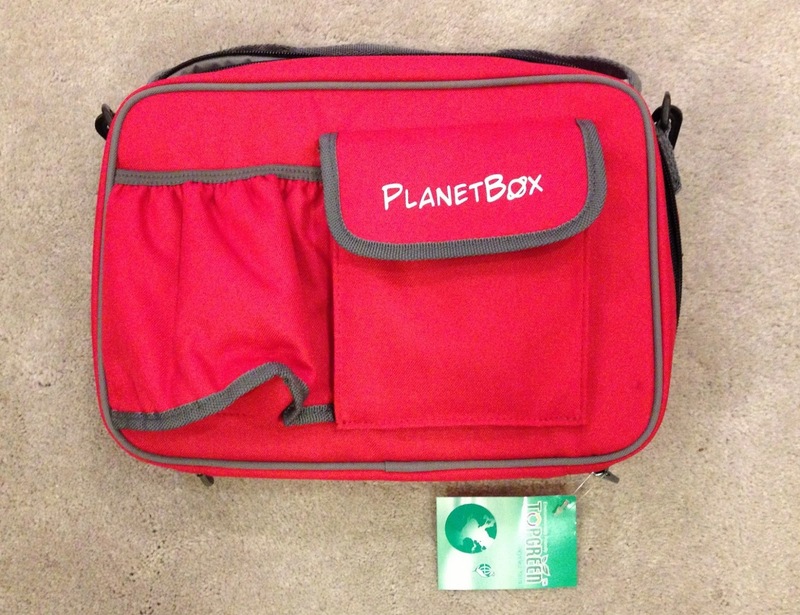 Overall, I like the PlanetBox system. I found it durable and easy to clean. The CarryBag is sturdy and the shoulder strap is handy. However, if you like an all-in-one system you must remember that the dippers are almost a necessity. These add extra pieces and cost. This stainless steel lunch box is unique and fun, but starting at $39.99, it comes at a price.